September 19, 2015 By Debra Schroeder 10 Comments This post may contain affiliate links. Traveling Well For Less has partnered with CardRatings for our coverage of credit card products. Traveling Well For Less and CardRatings may receive a commission from card issuers. Opinions, reviews, analyses & recommendations are the author's alone, and have not been reviewed, endorsed or approved by any of these entities. Read my disclosure policies. An oceanfront view, fine dining without the snobbery, and one of San Diego’s best kept secrets. Disclosure: We previewed the San Diego Restaurant Week menu as guests of Brockton Villa in exchange for my unbiased review. All opinions are 100% mine. That’s why I chose to try the San Diego Restaurant Week menu at Brockton Villa. Whether you’re a foodie or want to save money on a great meal, San Diego Restaurant Week is one of the best times to dine out in San Diego. From September 20, 2015 through September 27, 2015, you get a fixed price meal from $20 to $50 per person for three-course dinners and $10 to $20 per person for two-course lunches at over 180 restaurants. Reservations, while not required, are suggested. You can make reservations by calling and some offer online booking via Opentable. Here’s a little preview of the type of food you can expect during San Diego Restaurant Week. 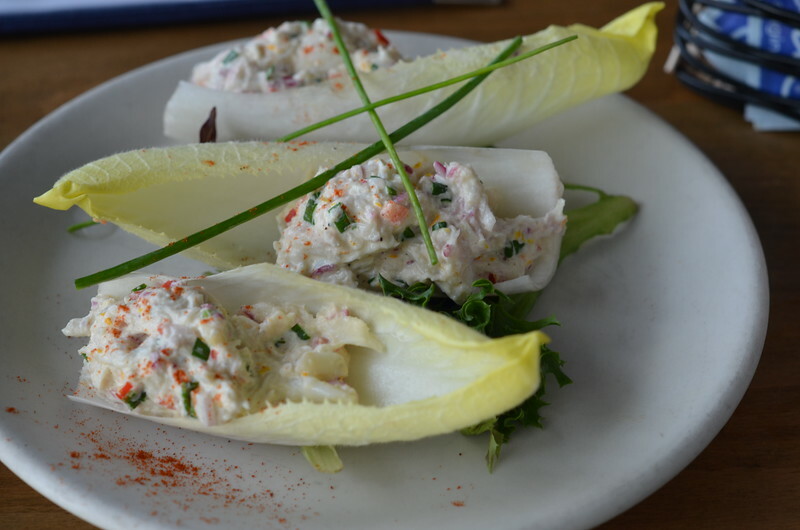 There are several fantastic restaurants in North County participating in restaurant week. But being so close to home takes away some of the magic and specialness that makes San Diego Restaurant Week so unique. 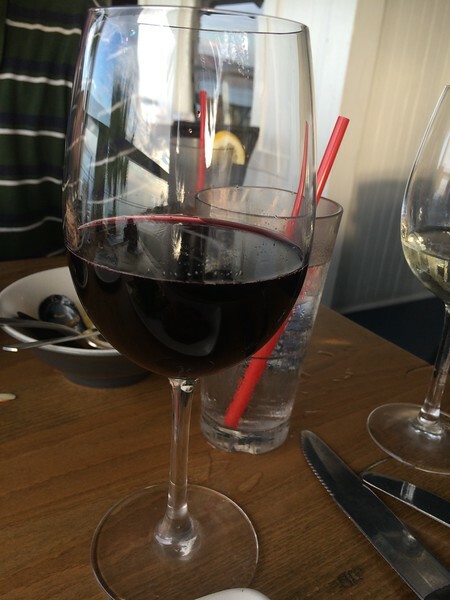 That’s why we make it a point to visit La Jolla restaurants, especially ones with ocean views like the Marine Room, Crab Catcher, and now Brockton Villa. In a prime spot on the coast overlooking La Jolla Cove, Brockton Villa was one of the first beach cottages built in La Jolla and dates back to 1894. Brockton Villa is an elegant yet casual restaurant that offers indoor and outdoor dining with breathtaking sunsets. Set on the cliff, it’s the perfect spot for a leisurely, friendly or romantic dinner. My husband and I were looking forward to having a date night. But he was sent out to the Butte Fire so a friend filled in at the last minute. A table on the lower terrace underneath an umbrella (not pictured) with an unobstructed view of the ocean. Or a corner booth/table on the upper terrace. Both tables were ideal with great views. Because I was taking photos, I opted for the table on the upper terrace where there was less foot traffic and fewer people. Friends like to call me semi-crunchy so I always get a thrill when restaurants use local and seasonal ingredients. A philosophy echoed by Executive Chef Mareyja Sisbarro and shown in her dishes. When dining during restaurant week you get to choose one option for each person’s first course. However, Brockton Villa treated us to all three of their first courses. 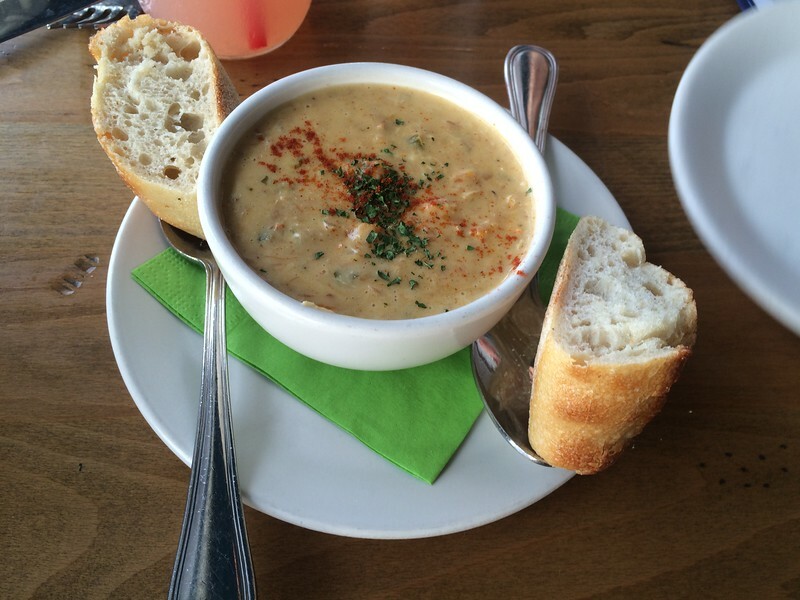 Brockton Villa’s “Epic Chowder” is a tribute to chowder by combining the potatoes and cream-base of a New England clam chowder, the bacon of a Rhode Island chowder, and the hint of spice from a Minorcan clam chowder. Two slices of french baguette were provided to sop up the chowder, but Chris and I did a fine job of polishing it off without the bread. Hearty chunks of clam, crabs, bacon, and potatoes make this a great start for a cool evening (although when we dined it was a hot and humid day). 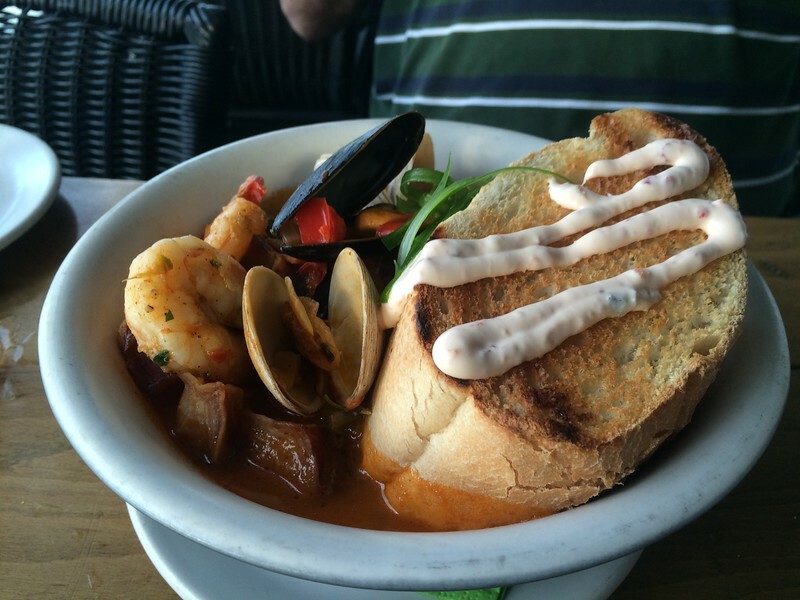 And I look forward to having this again during the winter as the “Epic Chowder” is offered on the regular menu. You can order a optional paired flight of wine with your meal, which I chose to do while my friend enjoyed an ice tea and a fresh Watermelon Margarita. With all three first courses, I had the choice between a sparkling white wine (Michel Olivier Blanc de Blanc Brut) or a Sauvignon Blanc (Ranga Ranga). 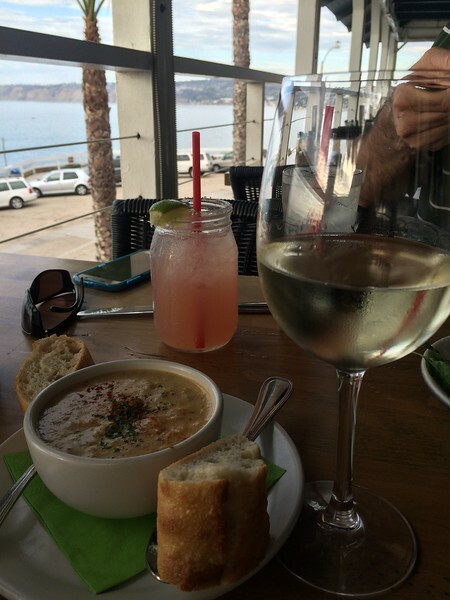 I asked our waiter, Darren, to “surprise me.” The Sauvignon Blanc went well with both the Epic Chowder and the Kale & Golden Fig Salad. And I realized if I didn’t temporarily put aside my portion of the Epic Chowder, the Kale & Golden Fig salad would be a passing memory. I had to act and I had to act fast. I deftly stuck my fork into the salad bowl, knowing that once I had done so, it would be all mine. It’s one thing to eat from the same bowl when you’re married (or related). It’s a completely different thing when it’s two friends sharing a meal. I had won and knew the rest of that salad was mine. 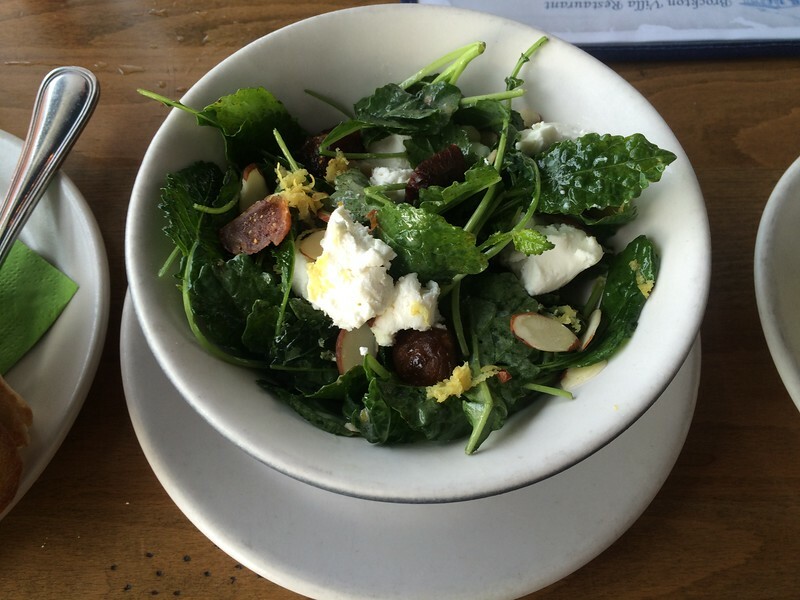 My friend was right, the Kale & Golden Fig salad was phenomenal. The sweet dried figs contrasted nicely with the lemon dressing. The salad is also part of Brockton Villa’s standard menu. The Lump Crab bites are a different twist on the crab cakes served on Brockton’s regular dinner menu. I liked the presentation and appreciated an alternative to a deep fried crab cake. But there was a bit too much mayonnaise for my taste. Everything except the rice bowl, halibut, and filet are part of Brockton’s regular menu. The rice bowl is traditionally offered in the winter and the seabass is seasonal. Because the filet was a special addition just for San Diego Restaurant Week, and while I don’t eat steak often the carnivore in me chose the red meat. The glazed crust was perfectly seared and the meat. It was like slicing through butter. Okay maybe not that easy. But oh how the knife glided through the meal without requiring any sawing action. Given a small bite (yes, there was no way I was sharing half my filet), my friend regretted his entree choice. And the bacon potatoes were mashed to perfection and the broccolini cooked al dente. 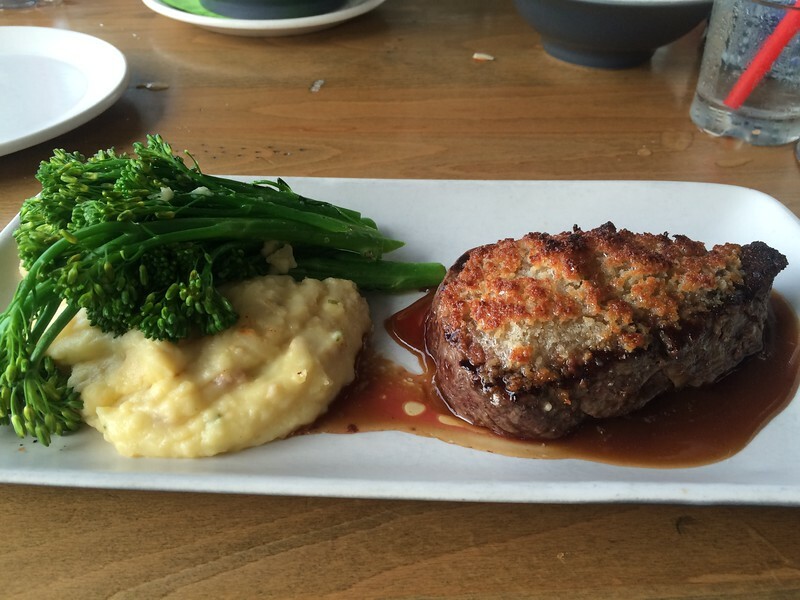 The cabernet sauvignon accentuated the flavors of the filet. The filet was paired with a Donati Cabernet Sauvignon. The rich, full bodied flavor was smooth and refined without being acerbic. 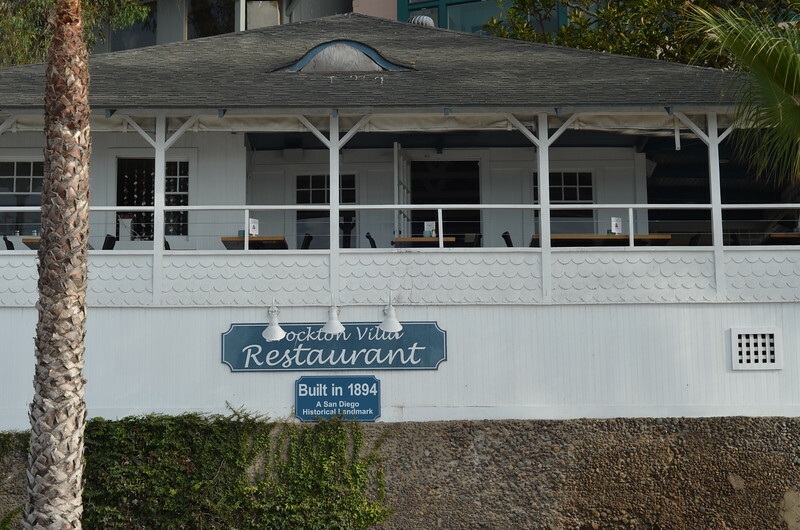 Brockton Villa is famous for their Coast Toast (also served as french toast on their breakfast menu) and their claim to fame is valid. I know where I’ll be going for my next brunch. I admit, I’m a s’more girl. Marshmallows and chocolate are my thing. And I’ve been known to melt chocolate chips on marshmallows on saltine crackers (yes, saltines!) in the microwave. That’s how bad I sometimes need a s’more fix (and there ain’t no NA or AA for s’mores addicts). 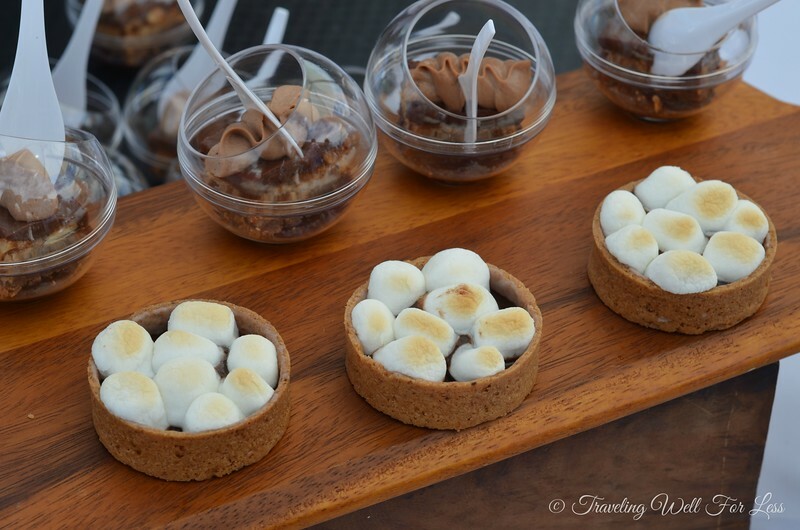 The S’mores Pot de Creme was heaven in a bowl. It was all I could do to not lick the bowl after scrapping it clean with my spoon. 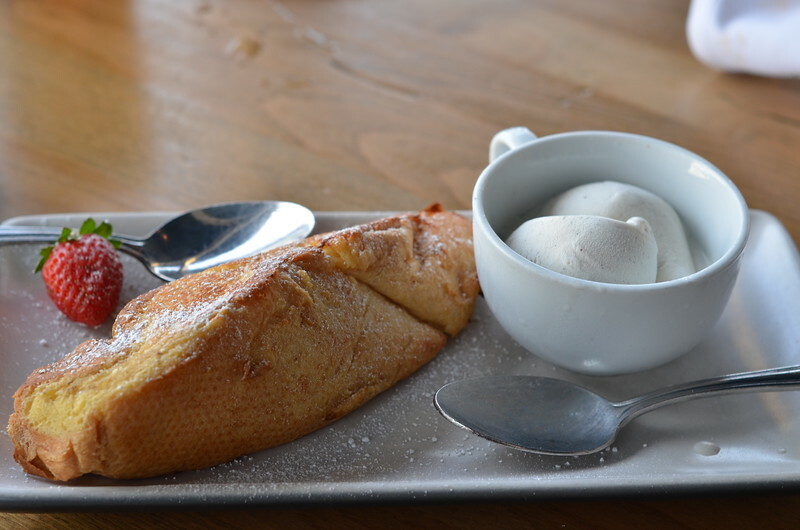 The only that could make the S’mores Pot de Creme better: add it to the Coast Toast. Which I did. Yep, you read that right. I put dollops of s’mores on my coast toast. In a word: OMG. A ten-year Portugese Sandeman Tawny Port paired with dessert which was silky smooth and so fine. I cried a little because I couldn’t finish it. Not because of the taste but because I was driving. I plan on going back to Brockton Villa for another meal during San Diego Restaurant Week. Will I order something different? Heck no! Why mess with perfection? You can enjoy lunch ($15 per person) or dinner ($40 per person) at Brockton Villa during San Diego Restaurant Week. A 4 ounce wine pairing with each course is available with dinner for an additional $15 per person. Brockton Villa is located at 1235 Coast Blvd., La Jolla Cove. If you decide to pay them a visit, tell them you read my review and that Debra (Traveling Well For Less) sent you. You won’t get anything special and I don’t get any commission, but they’ll be happy to hear that someone (besides my family) read this post. Spending time on social media gets a bad rap. But here’s how you can turn your Instagram, Twitter, and Facebook account into a vehicle for social good. Sysco San Diego will donate $1 to the “Food for Kids” program that provides food-filled backpacks to local children every Friday. Three simple steps and kids get fed. Great cause, you help kids, and it takes less than five minutes. Not in San Diego? Get yourself out here because San Diego was ranked # 1 in Best American Cities for Food by Conde Nast Traveler. San Diego Restaurant Week runs from September 20, 2015 through September 27, 2015. You can find a complete list of participating restaurants (menus included) on the San Diego Restaurant Week website. But San Diego Restaurant Week is only one week this year. So make your plans now. And remember to upload a photo of your restaurant week meal to social media, tag the restaurant and add #Food4Kids to help provide meals for children. I’m going back to Brockton Villa and trying a few other restaurants. Which San Diego restaurant are you planning on trying? « Money Back Deals, Free Night, and More! That was a fantastic meal! What a perfect view to have a such decadent food!! I’m jealous!! Definitely stop by when you’re in San Diego, so worth it. Depending on when you come, the sea lions might be out. There were at least 50 sunning themselves that day. Thanks for the great review and pictures Debra! Thanks for the kind word. You should definitely eat at Brockton Villa. 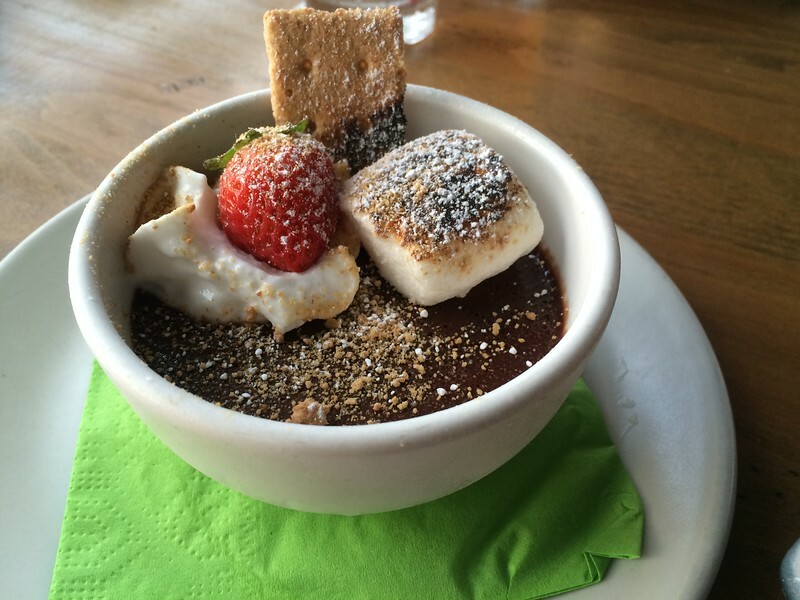 The s’mores pot was soooo good as were the rest of the dishes. San Diego is one of my favorite cities to visit. Next time, I’m going to have to check out this restaurant. 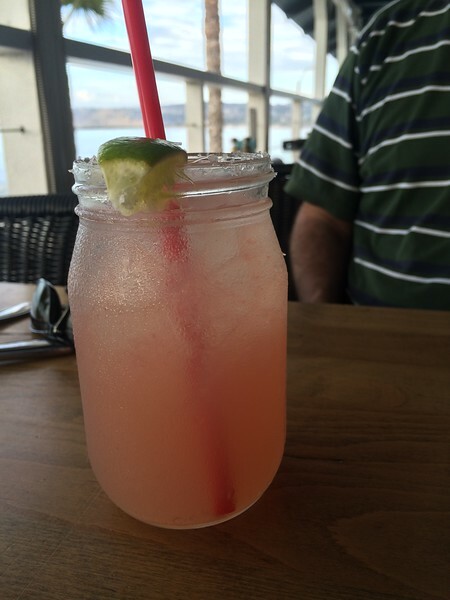 The food and drinks look fantastic and so do the views! Yes, please do. So worth. If you can, go right before sunset and sit on the lower terrace. I live in SD and have been to Brockton Villa a few times – love that place! This reminds me that I need to go back soon 🙂 Looks delicious! Thanks. What’s your favorite dish from Brockton Villa?